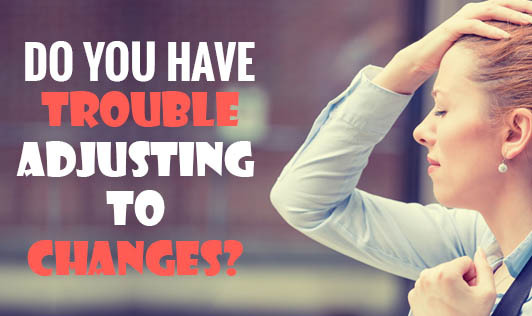 Do You Have Trouble Adjusting To Changes? Issues at work, going away to school, or experiencing any number of life changes can cause stress. Very often, people adjust to such changes within a few months, but if one persistently feels down or self-destructive, he or she may have an adjustment disorder. An adjustment disorder is a stress related mental illness. One may feel depressed or anxious and sometimes even have thoughts of suicide. Normal daily routines may seem overwhelming and one may make reckless decisions. In essence, one may have a hard time adjusting to changes which in turn, has serious consequences. Researchers are still trying to find out the exact cause of adjustment disorders. Adjustment disorders can affect one's whole life and he or she may feel overwhelmed, stressed and hopeless that makes it difficult to get through the day. Contact your doctor if you're having trouble getting through each day!